(TibetanReview.net, Dec02, 2015) – Chinese officials have described the Bharkor circuit of Tibet’s capital Lhasa as one of the safest places in the People’s Republic of China, referring to the extensive security measures it has put in place there to control and monitor the movement of Tibetans, reported Reuters Nov 30. The Bharkor is the most sacred pilgrimage circuit to Tibetan Buddhists and has also been a site of Tibetan protests against Chinese rule in the past. 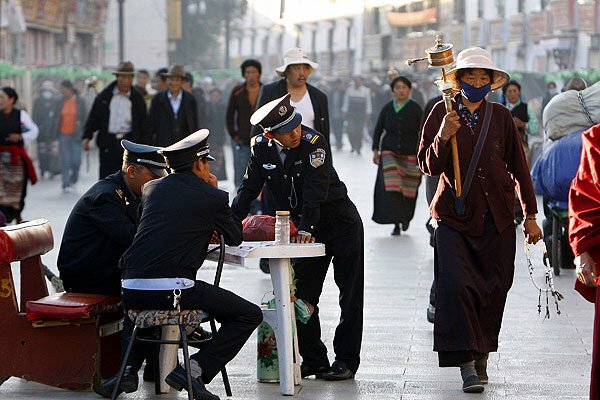 Apart from an on-the-ground surveillance network, guard posts erected among shops and in courtyards around the Jokhang Temple, which the Bharkor street encircles, watch the comings and goings of residents, the report said. The posts are manned by locals who are selected by the government and party controlled residents’ management committee. At night, the doors to the courtyards are locked, the report cited residents as saying. The security system is part of a “grid management” surveillance system aimed at managing society “without gaps, without blind spots, without blanks,” formally rolled out across the region in Nov 2014. “This is a Chinese speciality, where the masses participate in managing and controlling society and they also enjoy the results of managing their society,” Qi Zhala, the top Communist Party official in Lhasa, was quoted as saying. The security measures are said to be popular with the Chinese immigrants who have moved to Tibet’s capital in such huge numbers as to dominate the city’s ethnic makeup. Tibet is usually off-limits for foreign journalists and diplomats while foreign tourists are allowed only in controlled groups. On rare occasions, China conducts strictly controlled tours for foreign journalists to ensure that they see only what it wants them to report. It was on one such occasion that earlier in Nov 2015, Reuters reporters, along with a small group of journalists, were granted a rare visit to the region on a highly choreographed official tour, the report said. Chinese authorities restrict access for foreign journalists to Tibet, making independent assessments of the situation difficult, the report noted.